"I feel, and the Spirit seems to accord, that the most important doctrine I can declare, and the most powerful testimony I can bear, is of the atoning sacrifice of the Lord Jesus Christ. "His atonement is the most transcendent event that ever has or ever will occur from Creation’s dawn through all the ages of a never-ending eternity. "It is the supreme act of goodness and grace that only a god could perform. Through it, all of the terms and conditions of the Father’s eternal plan of salvation became operative. "Through it are brought to pass the immortality and eternal life of man. Through it, all men are saved from death, hell, the devil, and endless torment. 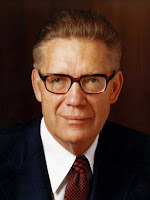 "Now, the atonement of Christ is the most basic and fundamental doctrine of the gospel, and it is the least understood of all our revealed truths. "Many of us have a superficial knowledge and rely upon the Lord and his goodness to see us through the trials and perils of life. "But if we are to have faith like Enoch and Elijah we must believe what they believed, know what they knew, and live as they lived. "May I invite you to join with me in gaining a sound and sure knowledge of the Atonement. "We must cast aside the philosophies of men and the wisdom of the wise and hearken to that Spirit which is given to us to guide us into all truth. "I am one of his witnesses, and in a coming day I shall feel the nail marks in his hands and in his feet and shall wet his feet with my tears. "But I shall not know any better then than I know now that he is God’s Almighty Son, that he is our Savior and Redeemer, and that salvation comes in and through his atoning blood and in no other way. "God grant that all of us may walk in the light as God our Father is in the light so that, according to the promises, the blood of Jesus Christ his Son will cleanse us from all sin." 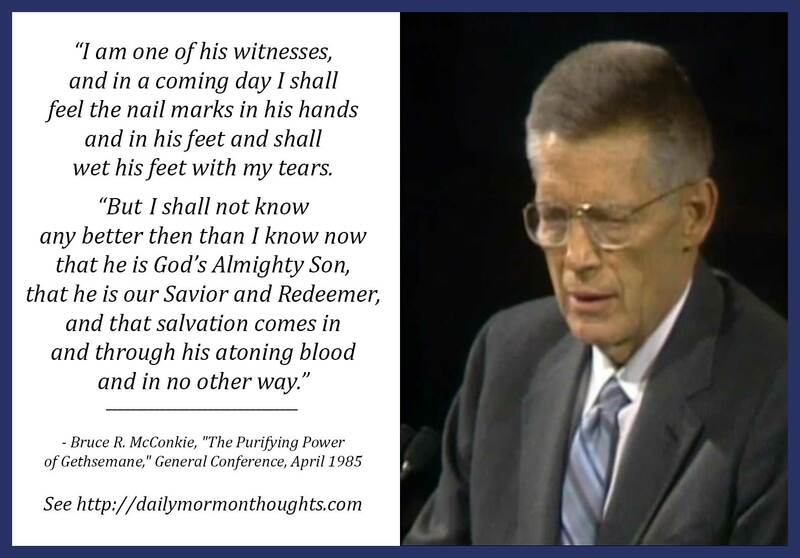 This remarkable message from Elder McConkie was given only about two weeks before he passed away—his "final witness" to the Church in mortality. Elder Russell M. Nelson followed Elder McConkie in the conference, and offered an expression of testimony and gratitude that Elder McConkie's life had been prolonged to deliver such a powerful sermon. Elder McConkie taught so powerfully in this message, as only he could, about the eternally significant and sacred nature of what transpired in the Garden of Gethsemane and on the cross of Calvary. The sermon is so full of truth and pure doctrine that it was hard for me to excerpt portions. 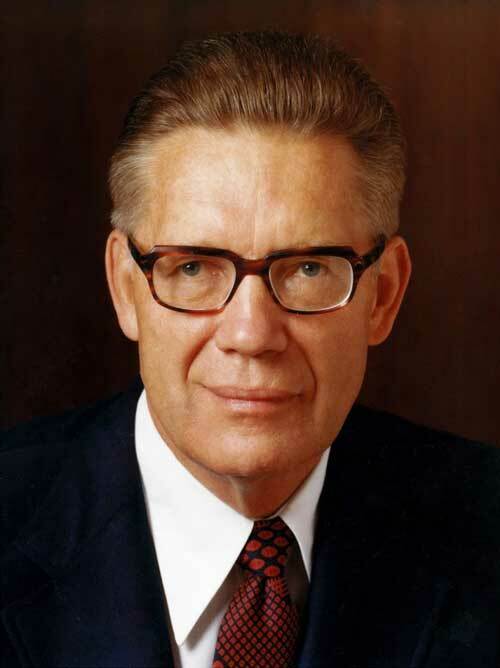 I was moved again by Elder McConkie's bold statement: "The atonement of Christ is the most basic and fundamental doctrine of the gospel, and it is the least understood of all our revealed truths." He follows that with an invitation and challenge that we each study and ponder anew in order to gain "a sound and sure knowledge of the Atonement." Elder McConkie did not know when he spoke these words that "in a coming day" would be less than two weeks away in his mortal experience. How blessed we are to have his pure and sincere witness, his clear teaching of doctrine, and his invitation to learn and be blessed by the sacred doctrine of the Atonement of Jesus Christ.